Vacationing with an eight-year-old granddaughter can be challenging. You need to have activities on your agenda that will keep your child entertained. I can promise you that the daylong Hummer Jungle Tour in Cancun, Mexico, is equal to the challenge. The vigilant iguanas, scores of them, watch your every step as they lazily sun themselves. They present themselves like guardians of this ancient city. Now is a good time to change drivers, if you like. Then it’s back into your Hummer. The four-Hummer caravan continues about nine miles to the ATV staging area. Here you receive instructions in operating your automatic ATV. Helmeted up and astride your ATV, you venture into the jungle. Blasting through a few water puddles and following your guide along the trail, eventually you arrive at a water-filled sinkhole called a cenote. These underground pools, sacred to the ancient Mayans, make a good cooling-off point. Our guide, after demonstrating, invited us to jump into the water about 30 feet below, or to take the stairs. My granddaughter eagerly took the jump (no fear); the rest of us took the stairs. After a few times zip lining into the water, we saddled up for the return trip. Not only is the ATV experience exhilarating as you hit the water puddles and crank it up on the road, there is also the opportunity to enjoy the jungle. You may see monkeys, parrots, butterflies, and (rarely) a jaguar or other creatures that inhabit these wilds. Following another short drive you prepare for zip lining among the trees. The skilled guides assist you in harnessing up and donning your helmet, and give instructions on using your wooden-block brake. Next you ascend about 20 steps and cross a swinging rope bridge. Now you wait for those in front of you to take their turns. Watching them swiftly gliding along, dangling below the cable, grips you with heightened anticipation. Finally you clip on and go! It is all over in a few seconds. After reviewing pictures and unharnessing, it’s time for lunch. Lunch is at a local restaurant on the Caribbean in the small fishing village of Porto Morelas. Just imagine yourself sitting in the open-air dining area, with the breeze gently blowing the smell of salt air across your face and the sound of the waves gently washing over the sand. Already a memorable day, more adventure waits down the road. The next stop, a zoological park, opens to the jungle; many of the zoo’s inhabitants roam the grounds. A private guide escorts you through the complex. Opportunities to “play” with snakes, hold an alligator (a small one), and receive a kiss from a parrot are available for the adventurous. When we returned to the hotel at the end of the day, my granddaughter and I watched the sunset over the bay, having shared adventures that will be remembered for years. She was ready for sleep. Hummer Jungle Tours is featured on many of the online travel sites or can be scheduled from most hotels in the Cancun area. The price for an adult is $155. Cancun Fun Tours (www.cancunfuntours.com, or by phone 888-414-0017) prices this adventure at $129 for adults, $92 for children (3-12), and under 3 free. 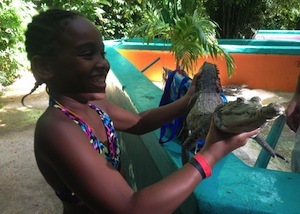 All fees for El Ray admission, ATV rental, zip lining, lunch, and zoo admission are included. Bring extra cash for shopping, drinks, and gratuity. 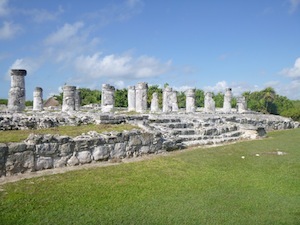 Similar tours are also available from Playa del Carmen and Riviera Maya.